however, before i continue on my obsession for the love child of brilliant stylists Howard, Garren, and Thom, i feel as though i should disclose that these products are not cheap. although sulfate, paraben, mineral oil, and petroleum free, R+Co does not offer college-girl-on-a-budget prices. i have, nonetheless, had my eye on these fantastic products for quite a while, and so with a little cash in my pocket, decided to try them out. i splurged for the tinsel smoothing oil ($24 usd…) at the SpaceNK satellite store in the Bloomingdales on 59th. i chose this product both for it’s matte holographic packaging (as aforementioned, i’m drawn somewhat foolishly to any product with a dreamy exterior) and, also, because my hair is coarse and in need of some nourishment. after showering, shampooing, and conditioning with my standard drugstore/Redken products, i pump the oil into my palm and rub it through the ends of my hair (all of which are, unfortunately, split). alas, the tinsel oil has managed to slowly start repairing my split ends and offering the rest of my hair a smooth, shiny, non-greasy (this is KEY), effervescent shine. 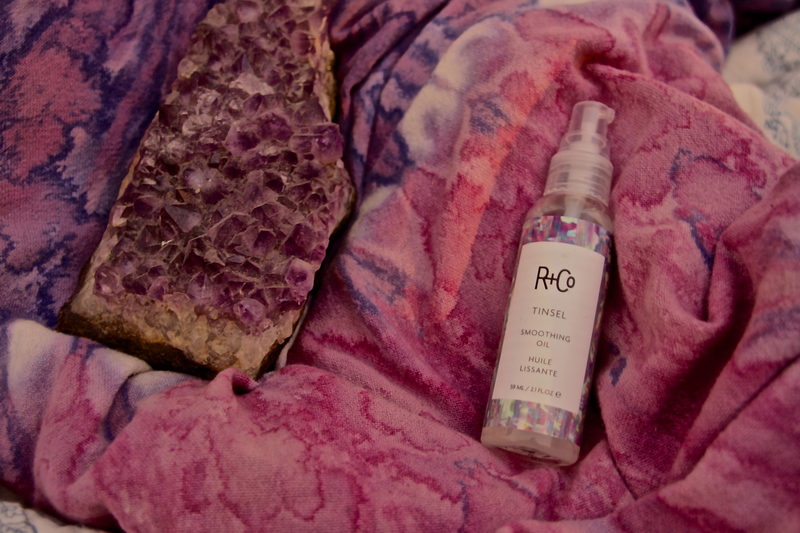 i appreciate beauty products that both heal longterm and allow ephemeral glamour, and R+Co products boast both of these properties. at the risk of breaking the bank, i look forward to purchasing more R+Co styling products because I know that i shall reap both long term and short term benefits. and let’s be real, using products with such glorious packaging makes me feel like an urban fairy with hair from heaven.